Long before this blog existed, my favorite question to ask people while waiting for our food to arrive at restaurants was, "If you could only eat one thing for the rest of your life, what would it be? And why?" And my step-dad once famously answered, grapes. It was a stunning answer, especially compared to other people's—like Matt and his choice of spaghetti and meatballs. (Good answer!) See, I had intentionally worded the question with a loophole. "If you could only eat one thing." I didn't say: if you could only eat one item. And I certainly didn't say one specific kind of fruit. If memory serves, I believe his reasoning was that grapes would also provide water, and then you had the option of drying them and enjoying raisins. Which is a great introduction to my step-dad, who was a Blue Angel in the Navy and has been trained on how to survive in the jungle for weeks on end sans creature comforts. So while the rest of us debated whether or not we'd get sick of spicy tuna after a month, my step-dad was planning how to keep himself alive. This particular tart recipe came from a chapter of My Berlin Kitchen. A couple of sentences in particular sold me on it. 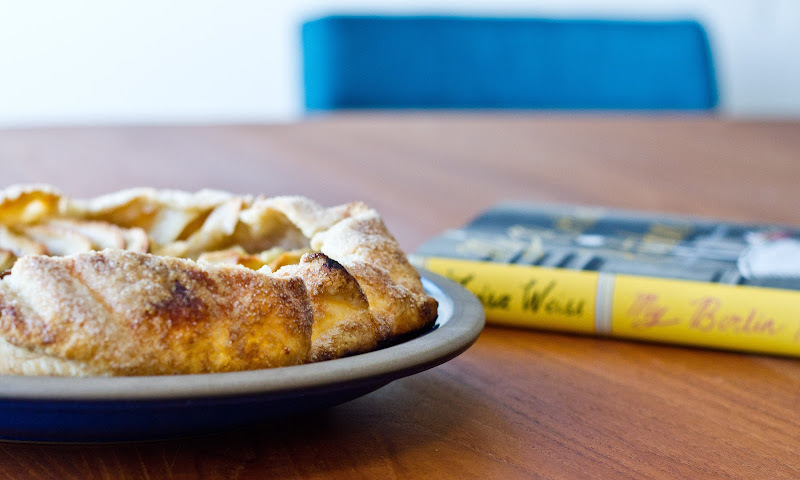 First: "The pastry was flaky as can be—it practically crackled under the knife." And secondly: "This tart is about the pure, clear taste of apples, sugar, and a little bit of butter." It's also one of those amazing recipes where if you buy apples, you probably have everything you need to make it. And lastly, may I just add that this was a true Bon Appétempt, because not only did I get that crackling pastry, but in this chapter, Luisa makes the tart post-argument with her father. And I made it post-argument with Matt. Not that I'm recommending you do the same, but maybe if you find yourself stewing after a fight, and you have the ingredients on hand, you should make apple tart. Just an idea! Oh my goodness, I almost forgot. This was the Thanskgiving Day dish winner! Emoji score? star, green apple, star, green apple, thumbs up, sparkling star. **Full disclosure: I accidentally threw away the peels and cores of the apples and thus, couldn't make the glaze. The good news? It was still super delicious. Place flour, sugar, and salt into the bowl of a food processor. Add the butter. Pulse until the butter is broken down into lima bean-sized pieces, no smaller. Drizzle in up to 3 1/2 tablespoons of cold water, 1 tablespoon at a time, processing or stirring after each addition, until the dough just holds together. You might need a little more or less water depending on the weather where you are. Dump out onto lightly floured work surface and gather it together, flattening into 4″ wide disc. Wrap in plastic and refrigerate the dough for a minimum of 30 minutes and up to 3 days. Preheat the oven to 400 degrees and prepare a lightly floured work surface. Then remove the dough from the fridge. Unwrap the dough and begin to roll it out with a pin, turning it over and over repeatedly so that it doesn't stick to the counter as it gets thinner. Flour as needed. 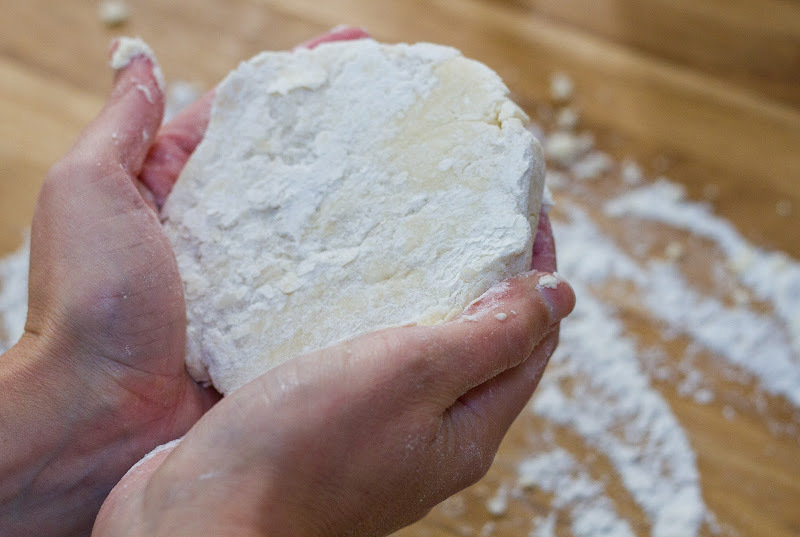 When the dough is a 14-inch round and about 1/8 inch thick, dust the excess flour from the dough with a brush. 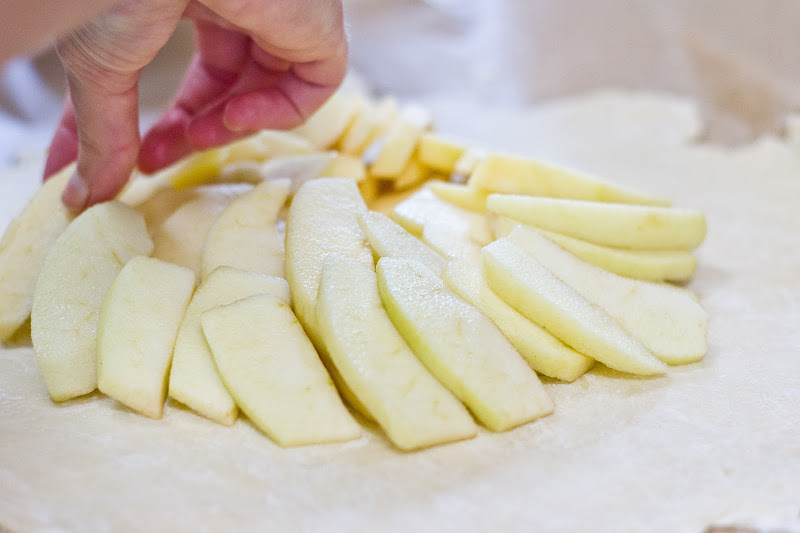 Place the apple slices in overlapping circles on the dough, leaving a 2″ border. Crowd as many apple slices as possible; they will cook down in the oven. 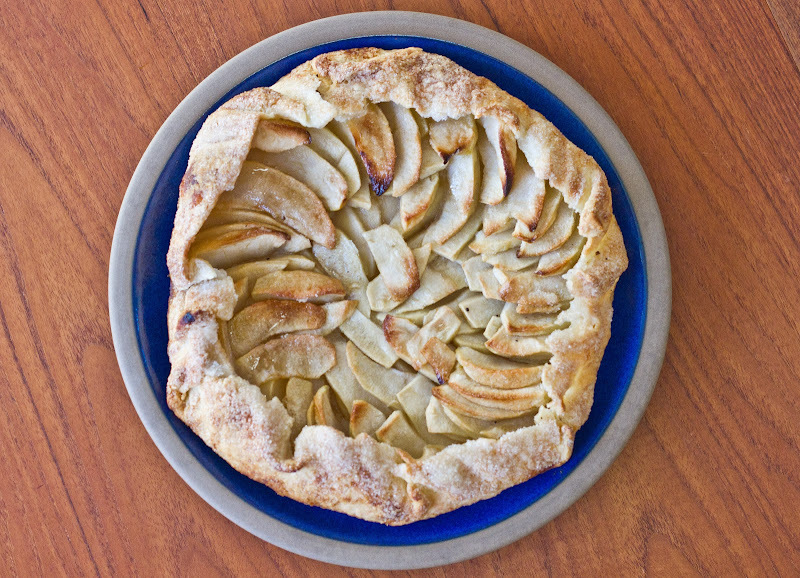 Fold the edges of the crust over the tart, creating a rustic crust, leaving the center of the tart uncovered. 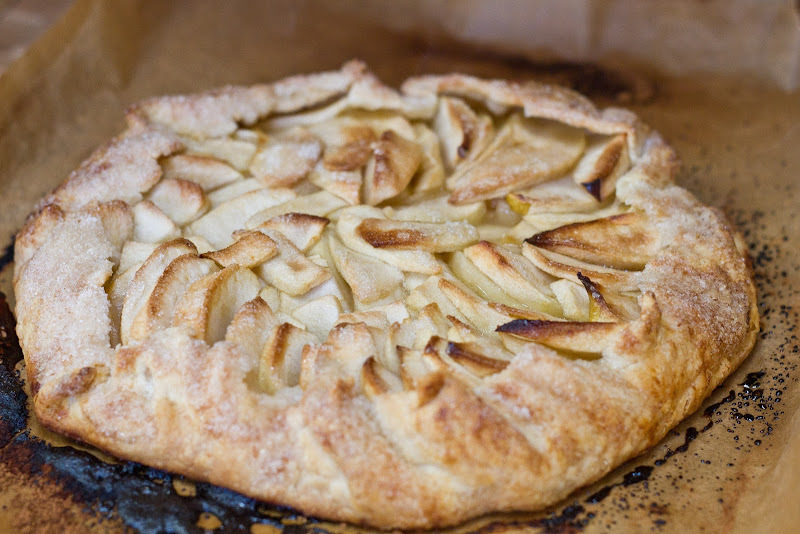 Bake in the center of the oven for 45 minutes, rotating halfway through, until the apples are soft, with browned edges, and the crust has turned a dark golden brown. In the meantime, for the glaze, put the reserved peels and cores in a saucepan along with the sugar. Pour in just enough water to cover, and bring to a boil; then cook for 30 minutes. Strain the liquid, discard the apple trimmings, and return the liquid to the pan and bring it to a low boil. Reduce it until thickened and syrupy, another 10 to 15 minutes. When the tart is finished, pull the parchment paper and the tart from the sheet onto a cooling rack. Let cool for about 15 minutes, and then brush the apple glaze over the apples. Serve warm or at room temperature. When is MTPs offically launching?? Would think you'd want it up for the holidays? Beautiful tart and beautiful photos! This is practically the exact same recipe as David Tanis's apple tart, which I made last week, including the glaze! Delicious. Here's a question: why does everyone say to chill the dough for so long? (Tanis says an hour minimum.) I barely chilled mine because I was in a rush, and it was totally fine. What's the deal? I made this same thing for Thanksgiving dessert, too! I loved it. And clever answer, I think I might copy you and say the same thing. Tarts are awesome, and they can fill every craving. I'd need to do more research to be sure, but I'm pretty sure that pockets of butter = flaky crust, so if it's not well chilled (both the butter and the dough) than you risk losing the flakiness! I would have to agree that the combination of butter + sugar + flour + apples would be, without a doubt, the only thing I would ever want to eat if I were stuck in such a predicament. I judge the quality of a bakery based on their apple tarts/confections. Grapes are a close second, though. Your step-dad forgot to mention that you can ferment them and get tanked! The other very important thing you can make from grapes? Wine. Well done on the tart! ohhhhhhhh, i assumed it had to do with ease of rolling/shaping. shows how much I KNOW! Also, I'd choose pizza with everything on it (including pineapple) because you could deconstruct it anytime you got sick of a certain ingredient. one day i might just eat the pineapple, another day the anchovies, another day the green peppers... it's the WINNER of this game! i saw this recipe and the book and have been wanting to try it.. yours looks gorgeous! I used to ask my dad questions like that and it drove him NUTS...good thing I now work in the social sciences and it's my job to ask (other) people questions. And I'd totally say watermelon. Hi to all,I am new person to the blog.The information about the recipes is very nice.Keep update the blog. Kelsey, I love this!! What a great question... I must think on it--don't want to answer WRONG--and get back to you! IN the mean time, what's yours?! So true, tarts are magical. They intimidate me, too. Kinda want a slice of this to magically materialize before me right about now. i just started liking tarts a while back. i think because i've never really been a fan of pies, i've always just shrugged off tarts. i like them when i eat them, but i never order them. HOWEVER, if i had to choose a sweet pie or tart it would be apple all the way. It's beautiful, Amelia!! So glad you liked it. You made a masterpiece out of an apple pie!